One thing that always Indian players are confused about is as how to make easy, friendly and instant deposits with INR at online casino to play games. The reason being, that most of the online casinos are located offshore and Indians want to make deposits in their own currency with those payment modes that are secure and safe for them. Not all online casinos accept INR deposits but there are also many online casinos that do accept players from India to enjoy various card games, slots and table games. The deposit methods popular for Indian players to fund their casino account to play real money or bet with real money at these online casinos are either with Credit cards, E wallets and netbanking or bank transfer. E wallets like Neteller work perfectly well so do the credit cards. But not all banks allow bank transfer or netbanking to gambling sites. In 2014 the Reserve Bank of India made things smoothier and easier for Indian players by launching RuPay Card which most of the online casinos have now started accepting as a payment mode for Indian players. 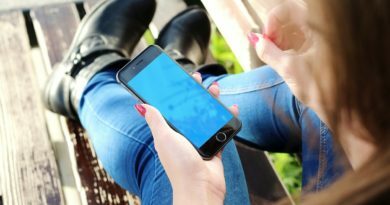 RuPay, a new card payment scheme launched by the NPCI(National Payments Corporation of India), has been conceived to fulfill RBI’s vision to offer a domestic, open-loop, multilateral system which will allow all Indian banks and financial institutions in India to participate in electronic payments. RuPay, the word itself has a sense of nationality in it. RuPay is the coinage of two terms Rupee and Payment. The RuPay Visual Identity is a modern and dynamic unit. The orange and green arrows indicate a nation on the move and a service that matches its pace. The color blue stands for the feeling of tranquility which is the people must get while owning a card of the brand RuPay. The bold and unique typeface grants solidity to the whole unit and symbolizes a stable entity. Reserve Bank of India, after setting up of the Board for Payment and Settlement Systems in 2005, released a vision document incorporating a proposal to set up an umbrella institution for all the retail payment systems in the country. The core objective was to consolidate and integrate the multiple systems with varying service levels into nation-wide uniform and standard business process for all retail payment systems. This led to the formation of the National Payments Corporation of India (NPCI). RuPay cards are accepted at all automated teller machines (ATMs) across India under National Financial Switch and under NPCI’s agreement with DFS, RuPay Cards are accepted on the international Discover network. According to the data published by National Payments Corporation of India, there are around 145,270 ATMs and more than 875,000 point of sale (PoS) terminals in India under the RuPay platform. In addition to the ATMs and PoS terminals, RuPay cards are accepted online on most domestic payment gateways with the same PIN which they use for ATM transactions. RuPay Cards are accepted at all PoS terminals in India. To enable this, RuPay has certified 29 major banks in India to accept the RuPay card at their respective PoS terminals located at different merchant locations. National Payments Corporation of India has been backed by 11 leading banks, of which 7 are public sector banks namely State Bank of India, Bank of Baroda, Punjab National Bank, Canara Bank, Union Bank of India, Andhra Bank and Bank of India; two private sector banks ICICI Bank and HDFC Bank with two foreign banks namely Citi Bank and HSBC. As of March 2017, over 600 banks, including all major public sector banks, several private banks, co-operative and rural banks, issue RuPay cards. Banks in India are authorized to issue RuPay debit cards to their customers for use at ATMs, PoS terminals, and e-commerce websites. About 25 million cards have been issued as of March 2014. 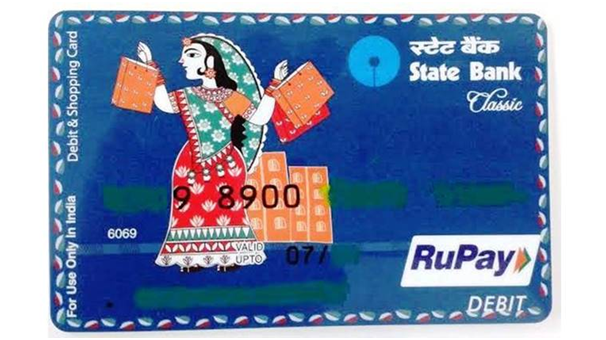 RuPay cards are also issued at about 200 cooperative and rural banks to promote financial inclusion. 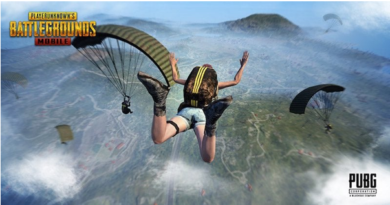 How to get RuPay card for gaming and entertainment? 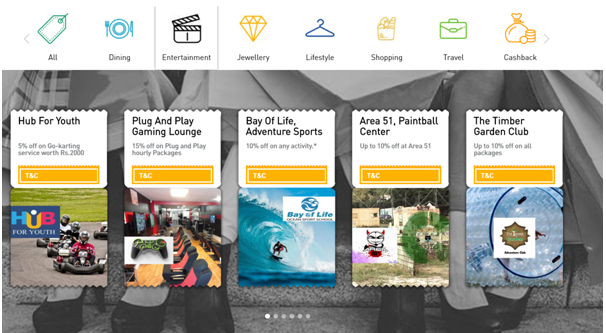 Indians can use RuPay card for their entertainment and gaming besides shopping, dinning and travelling. RuPay is available in Prepaid, Debit and Credit Cards. In Debit, they have Classic and Platinum Debit Cards. In Credit they have RuPay Classic, Platinum and Select Credit Cards. There are 700+ banks that issue RuPay Cards. There are more than 350 million cards issued till now. You may request your bank to issue you a RuPay Card. While filling the debit card request form and ensure that you have selected “RuPay” as your preferred card scheme. RuPay Global card with Discover, Diners & Pulse Network logos is accepted at over 39.3 million POS locations and over 1.88 million ATM locations in 185 countries/territories worldwide! Using RuPay Cards online can be done by entering your card details and then enter the OTP received by you. RuPay Card is accepted at online sites even at online casinos that allow deposits with RuPay. 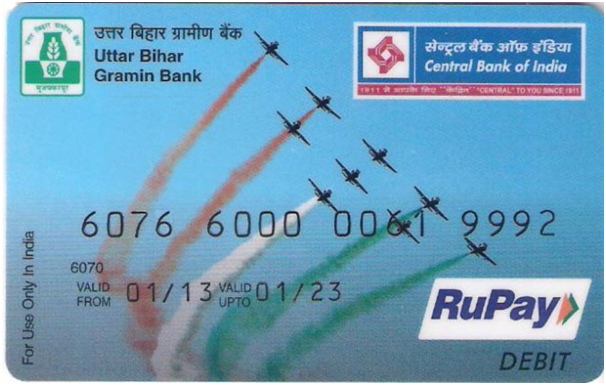 Click here to apply for RuPay Card. NPCI has rolled out its chip card for high security transactions using EMV (Europay, MasterCard and Visa) chip technology, which is a global standard for debit and credit cards. RuPay chip cards have an embedded microprocessor circuit containing information about the card holder and because transactions are PIN-based rather than signature-based. At present there are only few online casinos that accept RuPay. Gradually more online casinos will start to accept this payment method. Right now you can play Rummy, poker and slot games at these online casinos by making a deposit in INR with RuPay card easily. 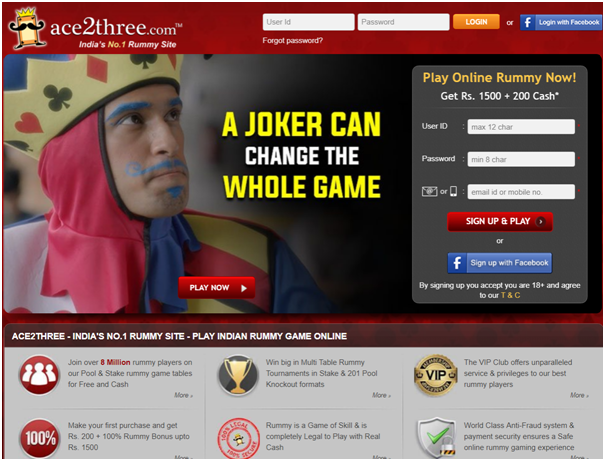 At Ace2Three play Indian Rummy and other Indian card games. Make a deposit with RuPay and get Rs 1500 plus 200 cash to play the games instantly. Use coupon code WELCOME100. For any queries call toll free 1800-123-9960. 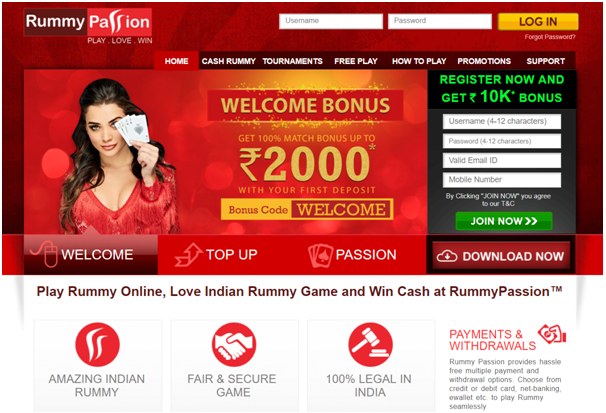 At Rummy Passion you can deposit with Net banking, Credit Cards, Debit Cards, Wire Transfer, Paytm, PayUmoney, Airtel Money and Rupay Card. Minimum deposit to play Rummy online here is Rs100 and Maximum is Rs20000. Get a whopping Rs 10,000 as bonus money in the first week of your deposits. You get up to Rs 2000 on your First Deposit, Rs 3000 on your Second and Rs 5000 when you deposit on Sunday to play the game of Rummy. Use coupon WELCOME as a new player to get the bonuses. At Classic Rummy you can play online rummy and n purchase Cash Chips from the Cashier Tab using Credit cards, Debit Cards, Net Banking, Cash Cards, Mobile payment, Wire Transfer and RuPay cards. You need to make a minimum deposit of Rs 100 to start playing cash games, though cash game tables start at Rs 1 in points rummy and at Rs 5 in other variants. The maximum amount that you can deposit is Rs 20,000/- per transaction. You can make multiple transactions if you wish. Get Welcome Bonus up to Rs 2000 on your first Two Deposits as a new player. 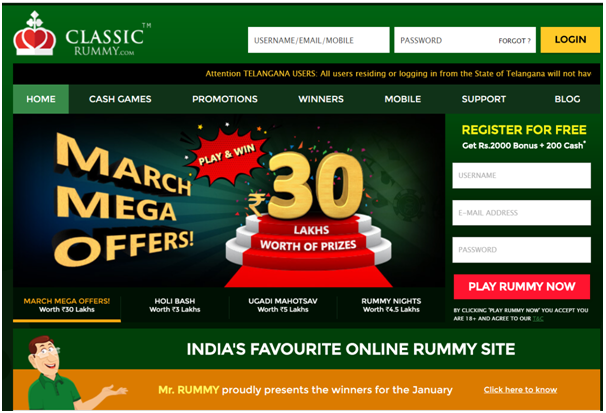 Visit Classic Rummy online now. You can make a deposit to play Rummy and bet on IPL matches here at Poker Baazi with RuPay. The minimum deposit you can make is Rs100 and maximum Rs5000 as a new player. You get 100% up to 7000 welcome bonus here. Use coupon code WELCOMEPB at the cashier to get started. Asli Rummy also allows you to use RuPay as payment mode. When you join the casino to play rummy you are offered 100% welcome bonus of up to Rs 500. 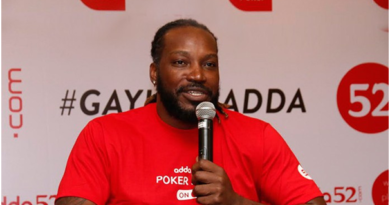 Enjoy best of poker games at Poker Yaar casino online. Enjoy Texas Hold’em, Omaha, Omaha Hi-Lo, Seven-Card Stud, Razz, Five-Card Stud and Five-Card Draw besides various other games. Pokeryaar provides different payment gateway options and ewallets such as Tech Process, Bill Desk, Payu Money and RuPay via which you can deposit money in your PokerYaar account safely and securely. 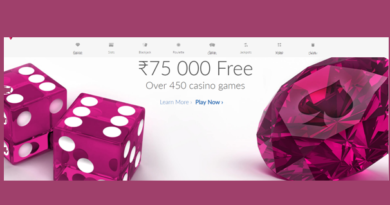 Get no deposit of Rs22 when you join the online casino. Then get 4 Tournament Tickets Free and 100% bonus up to Rs. 5000 on first deposit. Note that currently only these and few others casinos accept RuPay as deposit option for Indian players. If you do not find RuPay as payment mode then its better to use Neteller as payment mode at online casinos. March 24, 2015 winindia_fn0g0q Comments Off on Teens use apps to keep secrets?